If you played computer games during the 1990s, you might have heard of Logical Journey of the Zoombinis. It’s an award-winning puzzle game in which you guide small blue creatures (the “Zoombinis”) through perilous terrains to get to Zoombiniville. Along the way, you must overcome a series of obstacles that will challenge your ability to analyze data, look for patterns, and solve problems. If you miss playing Zoombinis or if you never had the chance to try it, don’t fret. Thanks to a successful Kickstarter project this year, the developers of Zoombinis have recreated the beloved classic for iPad. The new version offers the same gameplay, but it has been refined and updated with a more modern look. There are two things you must know about Zoombinis. The first thing is that each Zoombini has a unique appearance, even if they all may look alike at first glance. Two Zoombinis might share the same haircut and eye type, but have different colored noses. These little differences play an important role when you’re trying to move past obstacles, and give each Zoombini a distinct personality. Some Zoombinis even have quirky features, such as propeller feet and tank tracks. At the beginning of the game, you can customize each Zoombini’s appearance, or have the app decide them for you. The second thing you must know is that in Zoombinis, each obstacle represents a mathematical problem. In the first puzzle, for example, the Zoombinis arrive at a chasm guarded by two mysterious faces in the cliff. Each face is allergic to Zoombinis with certain attributes, and will sneeze violently if they try to pass. From these clues, you must deduce which bridge will bring each Zoombini to safety. In another puzzle, a huge stone lion blocks the Zoombini’s path, and will only move its paw once they are lined up in order. The ancient carvings on the wall provide hints about the basis of the lineup, whether it’s by nose color, eye type, or other attributes. In total, there are 12 puzzles that you must solve. Because the Zoombinis travel in small groups, you’ll have to play each puzzle many times to get all 400 Zoombinis to Zoombiniville. Do note that the same puzzle may not always have the same solution each time. And, as you become more effective at solving a puzzle, it will also progress through four levels of difficulty. 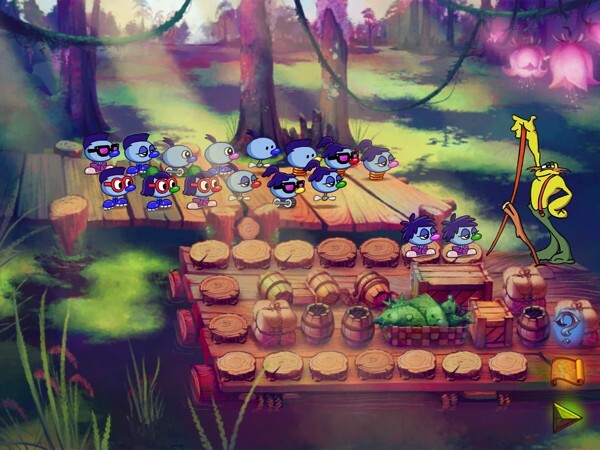 Zoombinis is a unique game that promotes important life skills, such as problem solving, logical reasoning, and systematic thinking. The puzzles are designed to mimic real-world problems in that they don’t always come with instructions, so players must learn to analyze each puzzle and find clues that will help them solve it. If you’re interested to learn more about the logic and design behind Zoombinis, you can check out the accompanying educational material on the developer’s website. Based on the skills required to play the game, I’d say Zoombinis is best suited for ages 9+. I’d recommend a grown-up be present to assist younger players, as they might get easily frustrated. The game is suitable for use at home or in the classroom, and you can create multiple profiles for multiple players. Zoombinis has no advertising and no in-app purchases. No Internet connection is necessary to play the game. Update: If you'd rather play the game on your Mac, you can now do so! The game is now available on Steam for Mac and PC. Alternatively, you can buy the game directly from the developer's website. In Zoombinis, each puzzle represents a mathematical problem. In this puzzle, players must arrange so that each Zoombini has something in common with his or her neighbors. I never played the original Zoombinis, but I have to say the iOS version is quite challenging. It doesn’t come with instructions, so you must rely on your ability to gather the information and patterns that will help you solve the puzzle at hand. Because sometimes you only get several attempts to complete a puzzle, it’s impossible to rely on luck alone. Instead, you learn to approach each problem systematically and put your reasoning skills to good use. That said, some puzzles might require several tries to complete. Fortunately, the game allows you to replay each puzzle many times. You can also take as much time as you need; there is no timer in this app. Another great thing about the game is the narrative. It’s interesting enough to engage and motivate player to complete the challenges. The Zoombinis, even though simple in design, are really cute. I like being able to customize each Zoombini’s appearance because it makes them more endearing to me. Most of the puzzles have no instructions, so players must rely on their ability to gather the necessary clues to solve the problem at hand.